I realized the other day that I have a few layouts I created a loooooong time ago that I never got around to sharing. It's always fun (sometimes in a "what was I thinking???" kind of way!) to look back on old layouts. Looking back on it now, I love the simple design and the mix of alphas in the title. I would maybe add more detail now, or switch out the purple alphas for something that stands out against the background more, but I love this the way it is and I'm glad I have it. This next one is really old, because the baby being photographed now walks everywhere and talks up a storm! I love the bright colors and circles, not sure I'd change anything. 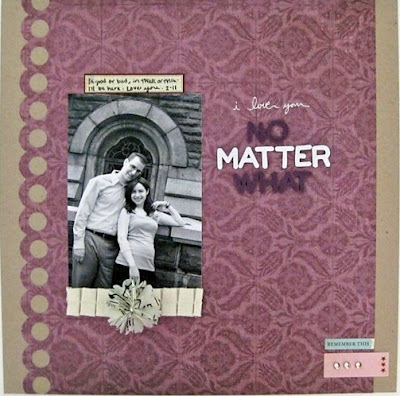 One of the funny things about looking at old layouts of your own is thinking about "style." I have a hard time describing my own style. From what I've heard from others, it's simple--I know this based on the fact that sometimes I make what I think is a super-complicated page, only to get tons of comments like "what a great simple layout!" I'd like to think it's whimsical, colorful, and "happy." At least on a good day:) Thoughts? You definitely have a "happy" style! Your pages convey a sense of joy. :) Love these bright colors. I would totally agree with you! Whimsical and happy! Love your style! "Happy" is so the right word for your style. Even when you've shared pages about difficult subjects, there still seems to be a happy, upbeat tone somewhere within the page. You do have a very happy and fun style with great color choices! to me your style is happy and full of heart! My style I always have a hard time defining so when some asks me i just say I'm a go by the seat of my pants type girl,so I just go with it one day it's simple the next it totally different . these are so cute~I agree is your style is soooo happy!!! Love it what a great way to be!!! I love them, I need to do more of my huband and I. You would think I would have tons of pages after 19 years (today's our anniversay btw, LOL) but I really don't, think I might have to change that. Wonderful layouts and the colors are brilliantly beautiful. I dislike trying to describe my style. I want to be able to do it all. Would have loved to view them at a bigger size but they are not available at a bigger size, when I click the pictures?! I really like the dark purple font against the dark background, just sayin'. But that is what I liked the best about that particular LO. I think we see ourselves so differently from how others see us. I'm coming to the conclusion that I don't need to worry about style so much as just do what makes me happy, take my time doing it and I end up loving those pages. But I can sure tell ya that my style evolves on an ongoing basis. I don't know if "simple" is how I would describe your style; I think maybe "clean" is better. And I do love your use of color! Pretty layouts Keshet! I do think your style is happy :) I have difficulty describing my style as well, hehe. Bright, I guess? I can't tell you what my style is. I have no idea. Maybe I don't have a certain style? Your layouts are bright and happy. But I know what you mean. I have been told that some of my work is simple....really? It took me hours to put it together, simple isn't the word I would use, lol. I love looking back on old layouts. I always have a hard time describing my style. I think it's definitely evolved over time, so that's maybe why it's hard? I love looking at old layouts too (well, usually anyway). 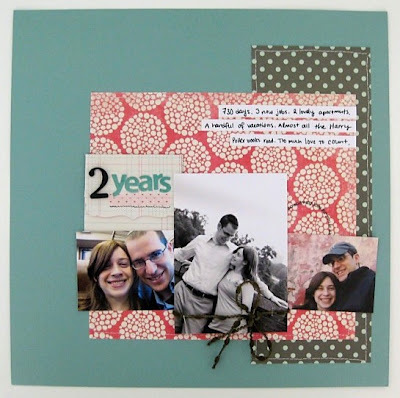 I really love your two year layout and how you tied ribbon around the photo. I used to do that long ago, not sure why I quit. As for my style, if I ever figure it out, I'll let you know! i think your pages are awesome...i can never figure out a way to describe mine either. i love going back and looking at old layouts. That baby one is so cute. 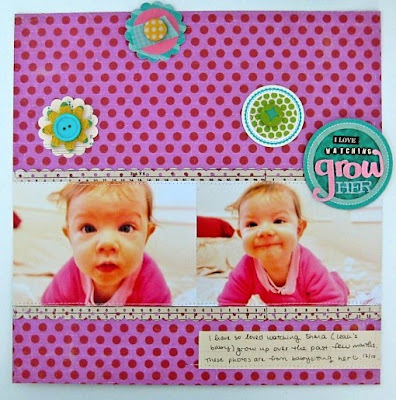 You'll have your own baby pics to scrap soon! What about "bold and graphic" as a style description? I used to hear that term a lot, but lately it seems like it's been replaced by the term "clean and simple." I think that "bold and graphic" sounds better though. What do you think? "Whimsical" is a perfect word! I think it describes your work nicely. These are great older layouts! I don't know how I would describe your style but it's fabulous! As far as my own style... I have no idea. I just try to create things that I love. As usual, I love your layouts and it's been an inspiration! I always visit here, just no time to comment. Even your old pages are lovely and well-designed! I agree . . . it's fun to see how our styles evolve. Those are great ideas. This is why we make things for the trip so we can have fond memories.